International Journal of Research in Health Sciences,2017,5,2,1-10. 1Department of Biochemistry, University of Ilorin, P.M.B. 1515, Ilorin, NIGERIA. 2Department of Biochemistry, Ladoke Akintola University of Technology, P.M.B. 4000, Ogbomoso, NIGERIA. Background: Folkloric medicine has emphasized the uses of indigenous spices and plants in the prevention of oxidative and inflammatory disorders from time immemorial. Inflammatory responses are patho-physiological immune mediated reactions, which are fundamental in providing protection against tissue injury and opportunistic infections, and have been implicated in the pathology of various degenerative and metabolic disorders, organ function losses and death. Objective: Fruit of Xylopia aethiopica, a renowned spice in soup/broth brewing in many homes in Africa was investigated for the anti-oxidative and anti-inflammatory potentials of the crude ethanolic extract, aqueous and n-hexane partitioned extracts in turpentine oil-induced acute inflammation in male Wistar rats. Materials and methods: Sixty three rats, aged 7-8 months old were allotted into nine groups and two groups received 100 and 200 mg/kg body weights doses of either the ethanolic, aqueous or n-hexane extract for 14 days and subsequently, 0.1ml of turpentine oil. The other three groups received respectively distilled water, 0.1ml of turpentine oil and distilled water and 0.1ml of turpentine oil and diclofenac. Various parameters, such as: plasma levels of tumour necrosis factor-alpha, C-reactive proteins, albumin, and peroxidase, gamma-glutamyl transpeptidases, total thiols, superoxide dismutase, catalase and malondialdehyde were determined in the plasma, livers and spleens. Results: The administration of turpentine oil elevated the levels of oxidative and inflammatory markers, while the activities of antioxidant enzymes were reduced (p<0.05). However, the rats administered the various extracts of X. aethiopica fruit recorded significant ameliorations (p<0.05) in the oxidative and inflammatory markers. 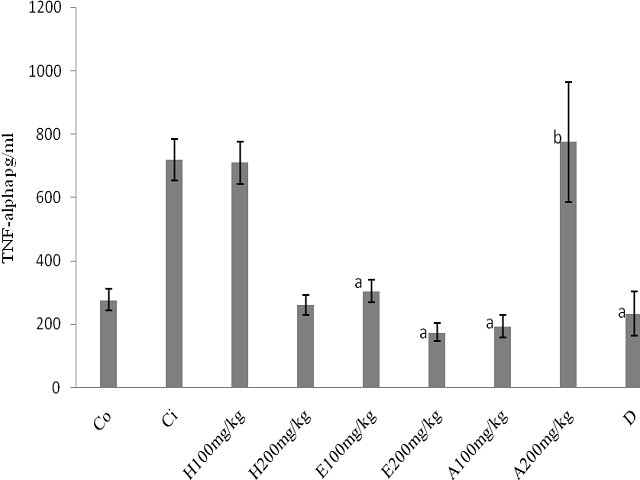 The crude ethanolic extract of X. aethiopica fruit presented the most promising results with no consistent variations (p>0.05) between the doses. Conclusion: From the foregoing, our study have indicated scientifically the modulation of inflammatory responses by X. aethiopica fruit extracts, and thus recommend its regular use as spice and alcoholic tinctures for improved quality life and protection against inflammatory disorders.